What a Life, What a Hero – Mark Loves History! 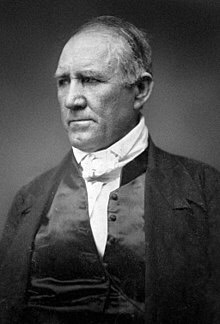 Today in History, September 5: 1836 – Sam Houston is elected the President of the new Republic of Texas. What a life! Born in Virginia, his family moved to Tennessee. As a boy, Houston ran away and lived for several years with the Cherokee tribe. His involvement with the Cherokees would resurface twice; once when he was placed in charge of their removal to the Arkansas Territory, and again when he would go to Washington to plead their case. Houston would serve in the War of 1812 and later be elected to the House of Representatives from Tennessee and then Governor of the state. Assigned by President Andrew Jackson in 1832 to obtain treaties with native American tribes in the Mexican state of Tejas, in order to secure the safety of American border traders, Houston soon became a leader of Americans living in Tejas that wanted independence from Mexico. He led the Texas army after the defeat at the Alamo and secured independence after taking General Antonio Lopez de Santa Anna prisoner. He later acted as part of delegation which resulted in Texas becoming a US state. When the Civil War came, he was Governor of Texas. He argued against secession and lost. In 1861 he refused to swear allegiance to the Confederacy and was deposed as Governor. A true patriot to the end.